1. Identify and confirm pest to be bed bugs. 2. Thoroughly inspect the area of infestation before proceeding with control procedures. Inspect all areas on the bed and around the bed including mattress, bed base, head board, bedside furniture, skirting boards, carpet edges, timber flooring, electrical sockets, wall hangings, photo frames, etc. See diagram below.3. Treat the infested areas with the appropriate control methods. 4. Encase mattress and base with Bed Bug Mattress & Base Protectors. 5. Ensure high standards of hygiene as a prevention measure. The bed bug (Cimex lectularius) has been a pest of humans for thousands of years but after the 1940’s and the introduction of DDT the numbers significantly decreased for a period of time. The improvement in hygiene in many countries also contributed to the decline of the insect. However the numbers and presence of bed bugs has increased significantly in recent years due to the increase in global travel and tourism. Although the adult and immature stages are blood suckers, bed bugs have not been linked with diseases of man. The developing nymphs and adults have piercing and sucking mouthparts often causing severe irritation as a result of the bites. Infections are more common in hotels, motels and buildings where sleeping facilities exist. Adult bed bugs are 4-5mm long. Oval shaped bodies. Rusty brown in colour. Prior to feeding their bodies are flat and after a blood meal they turn a reddish colour and are distended and oval in shape. Before laying eggs the female must have a blood meal. During egg laying, she glues the eggs to surfaces near where she resides. Each female will lay over 200 eggs in her lifetime being 12 months. Once the young hatch they moult about five times through immature nymphal stages before reaching adulthood. A blood meal between each moult is essential to their continued development. The life cycle from egg to adult can be as short as 50 days or as long as 12 months dependent on availability of hosts. Males, females and the immature stages are all blood suckers and usually obtain their hosts blood a few hours before dawn. They then return to their hiding places in cracks and crevices in furniture near beds and in part of mattresses. Skin that has been discarded from developing nymphs and fine excreta are often found on sheets and when the infestation is heavy a bug-like odour may be present. The bed bug usually injects an anticoagulant that can cause severe irritation in many victims. These are usually scratched which can lead to infection of wounds, but the bed bug does not usually convey diseases when it pierces the skin. Bed bugs can be carried from sites of infestation in luggage, on clothing and in furniture. It is this way that infestations occur in hotels and motels. While bed bugs are rarely found in houses where there is a high standard of personal and domestic hygiene, they can find their way on to clothing, in second hand furniture and in luggage when travelling and staying at infested premises. Adults and their eggs can be found in cracks and crevices. The eggs can be found glued on the surfaces of walls and furniture. 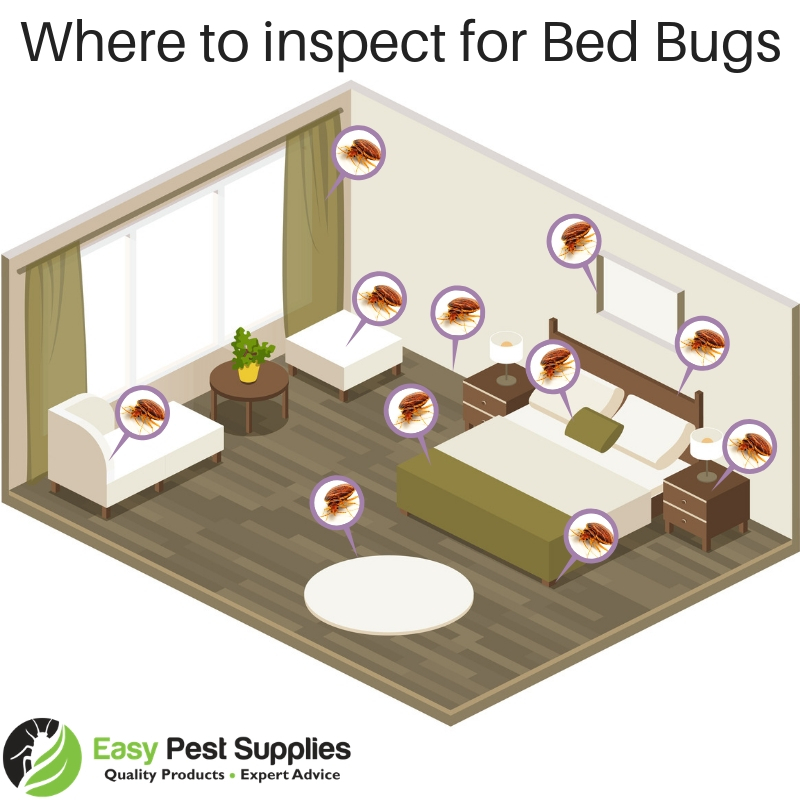 It is very important that when bed bugs are discovered that a thorough inspection be made prior to a chemical treatment. Chemical sprays are applied to surfaces with emphasis on cracks and crevices in walls and furniture. Where sprays cannot be used, dust can provide just as good control, particularly when applied into wall cavities and furniture.If mattresses are infested they can be removed from the room and treated with a low-toxicity spray. Where chemical treatment of a mattress is not acceptable for certain reasons the mattress can be wrapped in black plastic or a large black plastic bag and placed outside off the ground in full sunlight for three to four hours. A temperature of 50 – 60 degrees should be reached for this to kill all bed bugs present. Mattress and Base Protectors should also be fitted to prevent the escape and / or future infestation of the mattress & base by bed bugs.